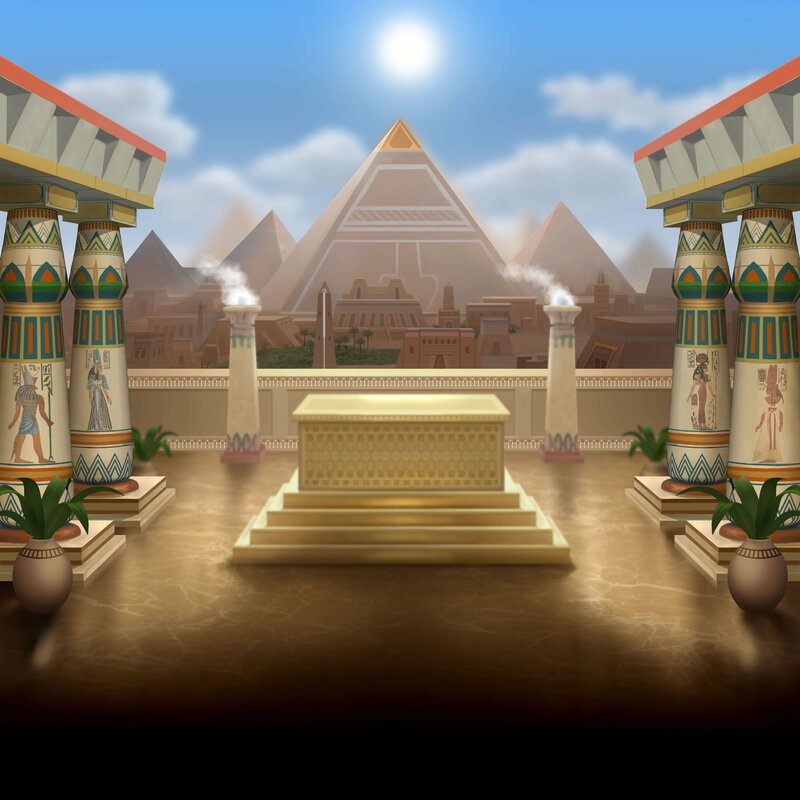 Legacy of Egypt welcomes you to enter the Egyptian palace to spin the reels and meet all of the ancient gods, queens and pharaohs who reigned over ancient Egypt. This exciting slot, developed by Play’n Go, has plenty to offer and has loads of opportunities for massive wins. 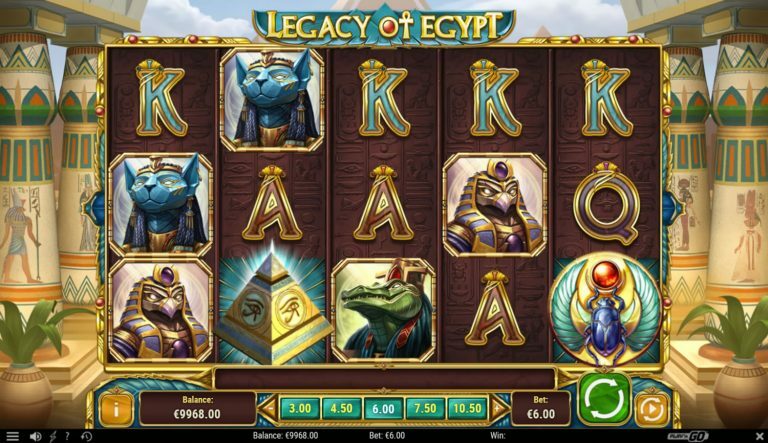 The Legacy of Egypt video slot is a 5-reel game powered by Play n’ Go software that has 30 betting lines. The slot’s design is inspired by the divine magic and mysticism of ancient Egyptian culture. The slot’s reels are set against a backdrop of ornate pillars and pyramids. Besides the eye-catching, high-definition visual design and animations, and visual effects, the gameplay is simple but interesting. The artwork has exceptional detail, however some of the characters appear very sinister and have a modern, cartoonish feel to them, but let’s not be overly pedantic because they really do look good and contribute well to the feel of the game. The first step, before spinning the reels is you will need to set your bet amount. You do this by clicking on the arrows on either side of the panel below the reels to set your bets to a value between 0.3 and 90. Your bet amount is per round and activates all the paylines. Legacy of Egypt boasts wilds and scatters and you can win up to 5,000X your bet amount which is rather decent for a slot like this. There are also Free Spins, Free Spins Multipliers, and the Wheel of the Gods feature, but more about that in a moment. Besides the lower-value A, K, Q, J and 10 playing cards, the higher-value symbols are represented by a variety of Egyptian gods and Pharaoh. They include: Sobek (the ancient god of crocodiles), Sekhmet (the goddess of sun, fire plagues and war), Ra (the sun god), Anubis (the god of embalming and the dead), the Pharaoh (the king of Egypt) and, of course, Cleopatra – Queen of the Nile. Of all the regular symbols, Cleopatra is the most valuable, since landing 5 of a kind on one of the paylines, will give you back 10 times your bet. Other symbols include the scarab beetle, which is the substituting wild and pays 16.6X your bet, and the pyramid scatter symbol that unlocks the free spins feature. The pyramid scatter is your key to unlocking the Free Spins. Landing 3 or more scatter symbols anywhere on the reels, activates the Wheel of the Gods. Here, you are presented with a wheel with values on it. Spinning the wheel will determine the number of free spins you are initially awarded – ranging between 3 and 20 free spins, each with a multiplier applied. While playing the free spins feature, the scatters act as wilds. If you land two wild scatters when playing through your free spins, you trigger the Pyramid Spins mode. The Wheel of the Gods reappears to reward you with between 3 and 8 Pyramid spins. Each pyramid spin uses the same multiplier that triggered the free spins round. If you land three wild scatters when playing the free spins, then the Pyramid Spins mode will be triggered as well, but with the added bonus of double the values on the Wheel of the Gods. What this means is that you can win as many as 16 Pyramid Spins. Once you have completed your Pyramid Spins, it returns you to the free spins mode to complete any remaining free spins. Legacy of Egypt slot does not have a fixed jackpot or a progressive jackpot, but the fact that you can win up to 5000x your bet on a single spin, more than makes up for it. Plus, if you add in the potential that the free spins and pyramid spins with the multiplier offers, then you can really rack up some epic wins. There are 30 fixed paylines. You do not have the option to adjust the number of active paylines i.e. your bet amount is applied across all of the paylines. RTP for the Legacy of Egypt is 96.5%. The Legacy of Egypt is a highly volatile game, so there is the potential for some astronomical wins if you are patient and manage your balance. While this beautifully designed slot from Play’n Go looks like something built for the gods, the gameplay is simple enough for even mere mortals like us to play and win easily. The striking symbols and animations, combined with the free spins and pyramid spins, make for good fun and potentially profitable playing sessions. If you’re an aggressive player that likes to bet big, you may need to curb your enthusiasm a little as the feature rounds do not come by as often as one would like. Overall, Legacy of Egypt is definitely one of the better Egyptian themed slots out there. Play the Legacy of Egypt slot at Rizk today.